Oral health is one aspect of your daily life that can essentially be forgotten about until something goes wrong. Keeping your gums and teeth happy is an essential part of maintaining overall body health, yet many individuals neglect their smiles until a restorative dentistry becomes necessary. Daily care is vital for retaining a healthy smile, yet the number of sugary drinks and overly processed foods work in tandem to damage your teeth. Concord Smile is proud to be your local dentist of choice in California, delivering a comprehensive approach to your oral health. From simple dental exams to tooth extractions and more, our specialists are here and ready to create a personalized care plan to optimize the health of your gums and teeth. Creating healthy habits for your daily life can help to increase oral health. Today, we’ll look at a few tips that may help you improve the outcome for your smile. If you’re in need of Concord’s general dentistry experts, be sure to reach out to our family dentists today! One of the best ways to minimize the health concerns for your gum line and teeth is to minimize the amount of harmful bacteria present. When this bacteria nests down into your gums, serious problems can occur. The tongue is one bastion for bacteria that should be brushed regularly to optimize the outcome. Bacterial buildups on the tongue can also cause bad breath, so be sure you are taking the time in your normal routine to scrub the surface! Relating to bacterial concerns is the need to retain a toothbrush that is in working condition and free of harmful bacteria. If you have an old, dingy toothbrush, throw it out! Dentists recommend replacing this handy tool every three or four months. After each brush, be sure to properly store your toothbrush in an upright, open position. Failing to clean your bristles can leave bacteria behind, negating that fresh feeling you experience right after a brushing. When not in use, your toothbrush should be kept in a dry area that retains suitable airflow. Doing so will keep the bristles dry, minimizing the chances of bacteria setting up camp here. The damaging effects of soft drinks can add up for regular drinkers. Throughout your daily activities, be sure to minimize the consumption of soda or high-sugar drinks to keep your teeth safe from harmful substances. The acid in soda can greatly weaken the enamel protecting your teeth. Be sure to focus on consuming more milk, fresh juice, water, and other low-sugar beverages to minimize the damaging effects on your teeth. If you have just finished a soda, be sure to rinse your mouth out with clean water to help minimize the exposure of acidic components on your enamel. Taking small steps during your daily life can create major changes down the road, especially when it comes to your oral health. Next time, we’ll continue on this topic by discussing a few more tips that can help to keep your smile happy. Anyone in need of top-notch specialty or general dentistry in Concord can benefit from visiting our local dentist. 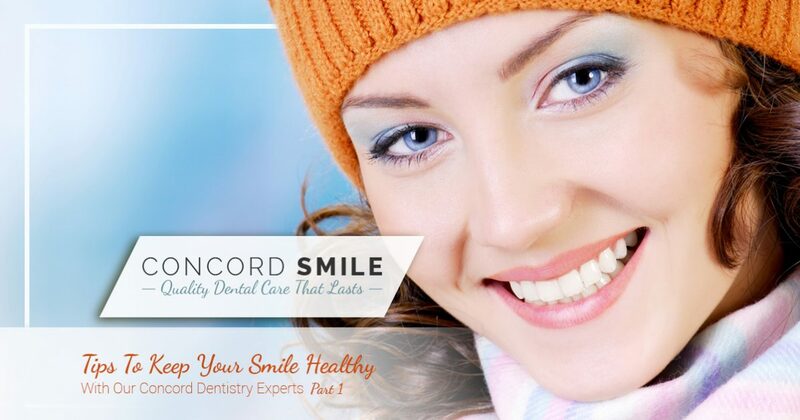 Concord Smile is proud to provide a comprehensive approach to dentistry needs for patients of all ages. Contact us today to learn more or to schedule your first appointment!